Due to the huge success of the original Vortex speaker series, Kam have launched the improved and much anticipated passive Vortex V2 series. This series of loudspeakers is ideal for professional applications including live bands, mobile DJs and public performance of all kinds. The new Vortex speaker cabinets are all built to deliver, having been engineered to the highest degree and constructed from high grade components. These passive speakers are available in four models including two full range speakers and two bass cabinets. 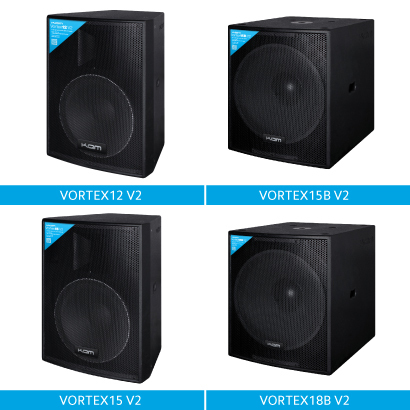 A combination of Vortex V2 speakers can make up an impressive and hard hitting PA system. Each passive speaker utilises premium grade components. The cabinets are made from high density engineered wood and feature a tough and durable painted finish, full steel mesh protective grille and integrated handles. The system of full range speakers and sub woofers are stackable with an integrated symmetrical design. The 12 inch full range Vortex 12 V2 and the 15 inch Vortex 15B V2 sub are a matched pair as are the 15 inch Vortex 15 V2 full range and 18 inch Vortex 18B V2 sub. Each speaker includes a pole mount for setting up a full range system. All four of the new Vortex V2 speakers are available now from all Kam retailers.